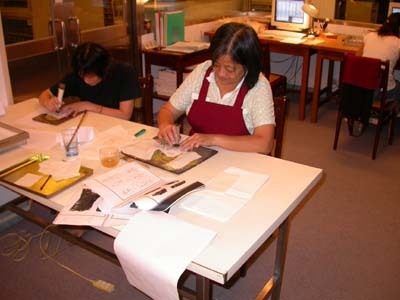 in Taipei, make rubbings of ancient Chinese oracle bone inscriptions. You are looking at a rubbing of a picture cast onto the back of a bronze mirror. A rubbing is easier to “read” than a bronze relief, which appears much like a shallow, sculptural relief, because it appears in black-and-white. A rubbing is made by pressing white paper onto the back of the mirror and then tamping it over with an inked pad. This turns a three-dimensional design into a black-and-white, two-dimensional design, which makes it easier to read. Chinese collectors liked to make rubbings of objects, such as ancient bronze vessels, stone inscriptions, carved ink stones, ink sticks, or mirrors. The rubbings themselves were treasured as collectible objects. Sometimes they would be copied in woodcut and then published in books for people interested in the study or collection of antique bronze vessels. 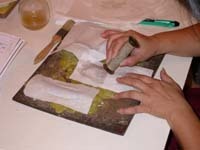 Technicians first moisten thin but tough Chinese “rice paper” and then tamp it into crevices with a fine, stiff brush. When the paper is almost dry, they apply an inked pad to make the rubbing. From about the twelfth-century BC, Chinese mirrors were cast in bronze (see a sample), with the back decorated in relief and the front polished smooth. Often the design for the back would be carved in wood or ceramic and then impressed into wet clay inside a mold for the back of the mirror. The mold for the smooth front would be left plain, with only a depression as deep as was needed to cast the mirror. After the clay was fired hard, the two molds could be fastened tightly together. Then molten bronze would be poured into the mold through a small channel specifically made for this purpose. After the bronze cooled, the smooth front would be polished, sometimes with the addition of mercury to create a brighter surface. The back of the mirror could be decorated with any number of attractive patterns or motifs. Some examples of the more common patterns include the following: flowers; water patterns; abstract designs; dragons, phoenixes or other auspicious creatures; mandarin love ducks; nature scenes; or scenes from history and literature.